1/13/16 See Below for Registration Form & Dates for Chargers Invitational ID Camps! 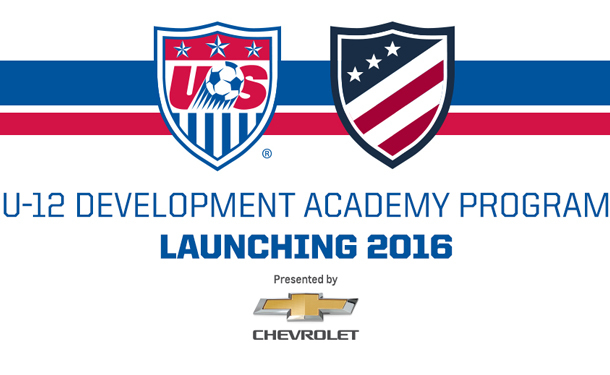 CHICAGO (Oct. 16, 2015) – In its continual effort to improve player development, the U.S. Soccer Development Academy program will be expanding to the Under-12 age group starting in the Fall of 2016. The expansion to U-12 will incorporate the same Academy philosophy as the older age groups, providing this critical younger age with an improved environment to enhance player and coach development. The players will train more often, while also playing fewer – but more meaningful – games every week, which will provide the American player with the opportunity to learn and develop to reach their full potential. “We are very excited to expand and introduce the Academy structure and philosophy to the U-12 age group when players are in their peak learning years,” said U.S. Soccer Youth Technical Director Tab Ramos. “That age represents a critical stage in a player’s growth, and this move represents another important step in our expanded efforts to improve elite player development." Click here for the rest of the press release on the U.S. Soccer website. Chargers S.C. Academy ID Camps are by invitation only (see birth years listed below). To be considered for invitation, please complete and send your completed Registration Form to the addresses on the form. Registration Forms will be reviewed before invitations are extended for an ID Camp. 2nd Round of ID Camps will be announce soon and the U-16s ID Camp dates are TBD.